Trolls Battery-Powered Coupe Ride-On Just $79! Down From $149! 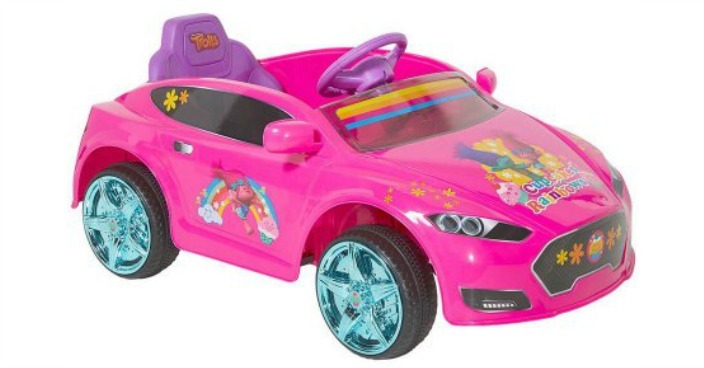 You are here: Home / Great Deals / Trolls Battery-Powered Coupe Ride-On Just $79! Down From $149! Right now you can get this Trolls Battery-Powered Coupe Ride-On for just $79 (Reg. $149) at Walmart! Your little girl will love this bright and stylish six-volt Trolls Speed Coupe with rainbow graphics! This six-volt coupe is decorated with images of Trolls, rainbows and cupcakes and features a charming purple interior and shiny blue “chrome” wheels. With a top speed of 2.5 miles per hour and a working horn, the six-volt Coupe is guaranteed to make any little girl smile!